I just made mashed potatoes with caramelized onions last weekend to accompany the smoked chicken dish I developed so it may seem a bit much to post more so soon after but I had more to cook and it got me thinking. Five pounds of potatoes in this house can see me easily end up pitching some for not getting to them soon enough as I’m no longer feeding my kids anymore, well, not daily at least. Even when my children were younger though, mashed potatoes were not something we often had and I think I know why I find myself enjoying them more now. 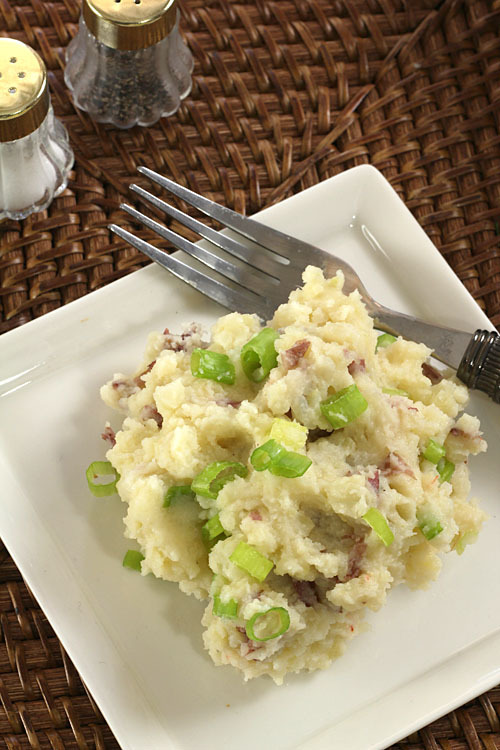 For me right now, I just love these mashed potatoes with garlic, green onion and goat cheese. Just love them! Call them smashed or rustic or whatever suits your fancy but I find I just love them more when they are not peeled and when the end result has more texture. There is a decided difference between smashed potatoes and lumpy mashed potatoes…they are most definitely not the same thing at all! I admit that my first foray into not peeling potatoes for mashing was because I thought it such a time saver. People might say that lazy people like rustic mashed potatoes but I take umbrage with that. Time savings was surely my impetus as a single mom…lazy was something I don’t think would be ascribed to me. Even when many, MANY years ago I used instant mashed potatoes. Oops, did I just say that? I recall that I first started doing ‘smashed’ potatoes using regular Russet potatoes and thought they were pretty good but soon moved to using Yukon Gold potatoes for a period of time. In both instances, it always seemed the skin was just a bit too much and once I starting using Round Red Potatoes I had found my own personal nirvana. Most recipes call for the higher starch varieties that I started with which is perfect for fluffy mashed potatoes but I prefer a lower starch variety; they absorb less water during cooking and I think have more ‘potato’ flavor than the others and I must admit I do like the extra boost of color. I liked that long before the consideration of today where that bit of color adds something to the photos I take of a completed dish. So for me…I just love everything about a more rustic course of action. But I have friends that are just the opposite; they prefer a smoother, creamier consistency. So my best is certainly not theirs and it seems, like many choices that are so personally subjective, the truth is that the whole notion of the best mashed potatoes is really about what is BEST for you. Peeled or not peeled. High starch or not. Butter or not. Sour cream, bacon on none of that nonsense…I think in the long run, it’s impossible to define one recipe for mashed potatoes as the best; it’s all about personal preference. For these Mashed Potatoes I used a 4 oz package of Cypress Grove Sgt. Pepper goat cheese and chopped scallions. Not just pretty but a very subtle kick from the pepper. Double yum. So I’ll share some of my secrets for success and you decide to peel or not peel, smooth or rustic…they are all good! Starting the potatoes in cold water allows the temperature of the potatoes to rise slowly and makes for more even cooking. If you throw potatoes into already boiling water, the outside starch granules will gelatinize on contact with the water which can impact cooking by blocking the water from penetrating further into the potato. Do add salt and other seasoning ingredients to the cold water you are using for boiling. I typically do salt and pepper but I have added other spices too. What tool should I use to mash my potatoes? There are several available for mashing potatoes and I can’t judge one as better as the other; I’ve used them all…except that in my current rustic mode I no longer put them through a ricer or mix in a mixer. But you can. A wire masher. This is what I have; it’s from Cutco and has always done a pretty good job. The coil gets filled with potatoes and I have to push it out often though. A flat masher; it looks like a manhole cover with several holes…pushing the potatoes through the holes results in the ‘mashed’ quality. A potato ricer; a tool that presses the potatoes to achieve a smooth consistency. It’s sort of a garlic press for potatoes. And my latest? I used my meat mallet today! I’ve found that the waxy texture of the red potatoes might make it a bit harder for my coil type tool to work so I decided to just ‘mash’ them but with something that would still give my the rustic texture I prefer. It worked so well I wish I had tried it years ago! However you make them, add the butter and mix it in before adding other dairy. The butter will coat the starch granules and works to keep them intact and not develop a gluey consistency that can happen from the liquid portion of your recipe. So add your butter and thoroughly incorporate it and then add your milk and/or cheese ingredients. Get creative with other ingredients. I love these lemon mashed potatoes but have added bacon, the aforementioned caramelized onions, cheddar cheese, sour cream, mascarpone and/or cream cheese and a constant array of different herbs. As much as I love mashed potatoes when they are just made, I almost love them for breakfast the next day just as much. I add a beaten egg for every two cups of potatoes, make them into patties and fry them on a griddle. After browning one side, add some grated Parmesan or cheddar on top and let melt while the other side browns. What is your favorite way of preparing mashed potatoes? The Best Mashed Potatoes. Really…What Does That Mean? Cook potatoes in large pot of boiling salted water until tender, about 20 minutes. Drain. Return potatoes to pot and mash roughly; these are not meant to be the consistency of regular mashed potatoes. Add butter and mix well with potatoes. Add goat cheese and mix thoroughly. Add milk as required to get consistency you desire. Add 4 Tbsp chopped scallions and mix in gently. I am definitely a smashed potatoes girl. Thanks for the basics – I do them so reflexively now, it’s nice to have a reminder of the hows and whys. I admit I take some basics for granted too but I hear from others with questions that remind me that my basics are information that I had to learn at one time so I’m going to try and do some more ‘informational’ posts. I like them creamy but I love, love, love leftover mashed potatoes done as potato pancakes! I do too Mary…I always make extra so I’ll have some just for that reason. I’ll trade you a bowl of mashed potatoes for a piece of tart. Deal? I could go for a rather large bowl of these right now instead of the smoothie I have to go make. 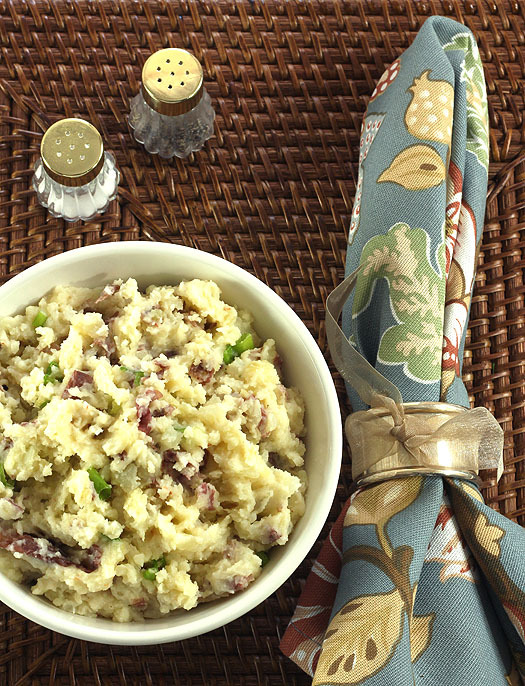 : / Have had a mashed potato recipe in my files I’ve been waiting to post forever. Duh! Who doesn’t love mashed potatoes, right? I have yet to hear someone say…just hate them! Not that smoothies don’t have their time and place but I get it for sure. I could eat mashed potatoes every single day. Lumpy, please. I could too Elle. As a matter of fact it seems like recently I have. Uh oh! I had never thought to put goat cheese in mashed potatoes before! I’m so glad I found this recipe – I happen to have goat cheese sitting in the fridge, begging to be used in something other than an omelette! I’m glad it was a fortuitous moment…please do let me know if you make mashed potatoes with the goat cheese. I would love your feedback. I’m with you. I go smashed all the way. Potatoes are most definitely my favorite food, so I have a whole long list of recipes I follow. My favorite: smashed potatoes with broccoli, bacon and cream cheese. Oh my…I think I could like those too! Do you have a recipe on your blog? I waiver between the chunky and smooth camp. I tend to like more rustic dishes so smashed potatoes really appeal to that sense but there’s something so comforting and old fashioned about the totally smooth mashed potatoes my grandmother used to make. I guess my favorite is partly so because I just think they are easier to make. I would not turn down either version and your comment reminds me of my Grandmother’s…always loved them too. Love this engaging post Barb. Your voice is coming through so beautifully. I too start with cold tap water, if I listened at Chemistry class I would probably have a good explanation why but yours are very good reasonings to the whys. I also add peeled whole garlic cloves and mash usually w/o skin & sofly cooked garlic. I love the smashed w/skin on potatoes but somehow when I have it at friends homes it tastes better than mine. Thank you Shulie; such a sincere and warm compliment from you is very much appreciated. I’ve added roasted garlic but haven’t cooked it at the same time…great idea. Never added goat cheese or left the peel on. Adding a bacon bites would make these beyond delicious. I’ve done bacon too! I’ve always figured if it’s a good topping for a baked potato then it would taste equally good in mashed potatoes right? I love your mashed/smashed potato tutorial! I always peel my potatoes before mashing, but I am definitely going to try some smashed reds with the skin on. Love the addition of goat cheese too! I have to say I like both smashed and smooth potatoes, but if forced to choose, smashed would probably beat out smooth! What a perfectly timed post Barb! I’ve just read the first frost may be coming close this week and the comfort of more substancial, warm foods always quickly follows! Mashed potatoes have come such a long way with so many more options than I think people even consider. You’ve done a great job spelling it all out with great instruction and options. There are so many more types of potatoes now, it can be confusing about how interchangeable (or not) they all are. You’ve taken a basic dish and made it special; bravo! Your recipe with the goats cheese and green onion is my favourite. I loved rustic mashed potatoes too. We have a recipe (another fav) where we beat in two eggs and add parmesan cheese and grated nutmeg. The kids love this one. I’ll bet it taste similar to your breakfast patties. If you have time. check out one of my fav. 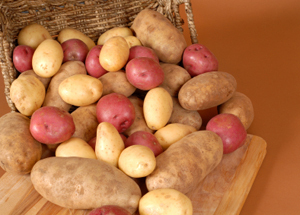 Irish blogs -http://dailyspud.com/ – this is a great site for all thing potato. Hope you are enjoying the early days of Autumn. I’ve done Parmesan and eggs but not nutmeg so I’ll take a cue from you and will try that Mona, thanks. Great link too; now I’m thinking what I can do with another 5 pounds! Rustic and potatoes = YES please! Thanks for those precious tips B; I intensely dislike gooey mashed potatoes. That goat cheese in there sounds delish. Love the hue of the pictures too; the rattan, the linen … all good stuff! For me potatoes are such a comfort food that they can not be done wrong, well unless they are burned. I love the goat cheese addition, btw. I do have a lot of potatoes in the house for just one when I buy a 5 lb bag so I’ve been enjoying the different varieties of mashed potato dishes I’ve come up with. This was a big favorite but I’m in the midst of a love affair with goat cheese too so I’m sure that’s a part of the love. Well, your commentary was so right on Greg…using it for SEO sort of distills that value entirely. By whose measure? But I will tell you, I made some chocolate chip cookies a couple of weeks ago that I think ARE the best I’ve ever had. Brown butter and molasses mixed with sugar to make the brown sugar? Oh my. I tried them without nuts but am going to test once more with toasted walnuts before posting. Better than any of the best I’ve ever seen cited and tried. My husband has claimed the title of *Potato Masher* and honestly, he does make delicious, fluffy and lumpless mashed potatoes (never fails). Having said that, your skin on smashed/mashed potatoes are going to be tried here in this house. I too love leftovers pan fried with eggs but have never done them with the eggs mixed right in with the potatoes and made into patties. Another great idea I’m going to use from this site. P.S. Those red potatoes are the perfect ones to use to make Roasted Rosemary Potatoes. I know! I love them like that too. More of a winter when I don’t mind turning on the oven dish but it will be done this winter, promise. You make mine and I’ll make yours. Deal? I like any kind of mashed or smashed potato. My favorite add ins are garlic and a touch of sour cream. You are right, a few skins just add a texture and character that can’t be beat. As soon as my son goes off to college, I putting the skins back in mine. There has to be an upside to the kids moving out. Your potatoes look so good. You sound like me with chocolate chips cookies. Bye honey, love you and now I can add walnuts again. Whoo hoo! 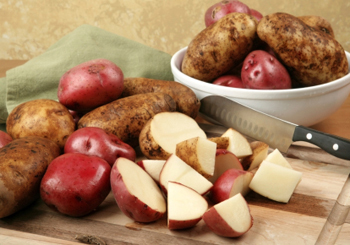 I do love super creamy potatoes made with a ricer, but these rustic potatoes sound great too. Especially leftover as potato pancakes. Me too…the potato pancakes business…that was dinner! Oh, yes, I totally agree that leaving the skins on enhances mashed potatoes. Not only do I prefer the taste and texture, but we do really eat with our eyes first and the skins make a much more attractive presentation. I typically use Greek yogurt in them and had not thought of goat cheese! I’ll certainly give that a try in my next batch. First of all, goat cheese really makes mashed/smashed/whipped potatoes sing! Secondly, love the tip about the meat mallet – I get alot of waxy potatoes from my CSA share and you are right that they don’t work well in the ricer (my masher of choice when I want a smooth texture). Gotta try that! Doesn’t it though…seems the perfect match for me. I just finally got to the Cypress Grove Chevre website to find what kind I had used and it’s call Sgt Pepper. Just a bit of zip to it too! I was frustrated with the masher sort of slipping, had my utensil drawer open and saw that mallet and it was meant to be. I have one of those with one smooth side and a spiky sort of side…I used the spikes; sort of grabbed hold of the skins and worked perfectly. Great mashed potatoes! I love the flavors you chose. Mouthwatering. Nothing compares to the homemade version. Thank you Rosa…lately I’ve been enjoying the little guys maybe a bit TOO much!